Direct-Coupled Switching Circuit – When a transistor is used as a Biasing Transistor Switching Circuits, it is either biased off to IC = 0, or biased on to its maximum collector current level. Figure 5-53 illustrates the two conditions. Note that the circuit in Fig, 5-53 is termed a direct-coupled switching circuit, because the signal source is directly connected to the circuit. In Fig. 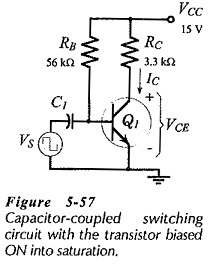 5-53(a) the negative polarity of the base input voltage (VS) biases the transistor (Q1) off. In this case, the only current flowing is the collector base leakage current (ICBO) which is normally so small that it can be neglected. Now consider Fig. 5-54, which shows the output characteristics and dc load line for the Biasing Transistor Switching Circuits in Fig. 5-53. The load line is drawn by the usual process of plotting point A at (IC= 0 and VCE = VCC), and point B at (VCE = 0 and IC = VCC/RC). At this point the transistor is said to be cut off. The region of the characteristics below IB= 0 is termed the cutoff region. When IC is at its maximum level, the transistor is said to be saturated, and the collector-emitter voltage is the saturation voltage (VCE(sat)). 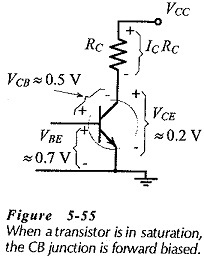 The region of the transistor characteristics at (VCE(sat)) is termed the saturation region. The region between saturation and cutoff is the active region, which is where a transistor is normally biased for, amplification. From the load line, it is seen that VCE(sat) is dependent upon the IC level. For the 2 kΩ load line shown dashed in Fig. 5-54, VCE(sat) is smaller than for RC =1 kΩ. If the transistor hFE value is less than the calculated hFE(1) value, IC will be lower than the level required for transistor saturation. If the actual hFE of the transistor is greater than the calculated hFE(1), IC tends to be greater than the current level required to saturate the transistor. However, IC cannot exceed VCC/RC. Consequently, an hFE value larger than hFE(1) will adjust down to hFE(1). An hFE value lower than hFE(1) cannot adjust up. So, to ensure that the transistor in a switching circuit saturates, it must have an hFE value equal to or greater than the calculated hFE(1) for the circuit. VCE(sat) is typically 0.2 V for a low-current silicon transistor, while VBE is typically 0.7 V. Consider the circuit in Fig. 5-53(b) once again. 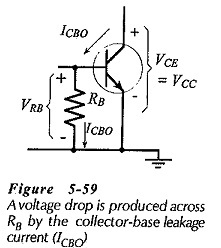 If VBE = 0.7 V and VCE(sat) = 0.2 V, the transistor base is 0.5 V more positive than the collector,(see Fig. 5-55). This means that the collector-base junction, which is usually reverse biased, is forward biased when the transistor is in saturation. With the collector-base junction forward biased, fewer charge carriers from the emitter are drawn across to the collector, and the device current gain is lower than normal. The base bias circuit in Fig. 5-57 is similar to circuits of that type that have already been considered, with the exception that the transistor is biased into saturation. Although too unpredictable for biasing amplifier circuits, base bias is quite satisfactory for Biasing Transistor Switching Circuits. The transistor in Fig. 5-57 is in a normally-on state with VCE = VCE(sat). The capacitor-coupled (pulse waveform) input turns the device off, giving VCE = VCC. The collector current can be determined From Eq. 5-25, and then the minimum required hFE value can be calculated from Eq. 5-27. 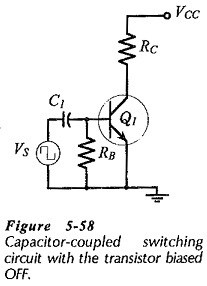 Another type of capacitor-coupled switching circuit is illustrated in Fig. 5-58. In this case, resistor RB keeps the transistor base-emitter voltage at zero, to ensure that the device is in a normally-off state. The capacitor-coupled input voltage biases the transistor on into saturation. The resistance of RC for any one of the Biasing Transistor Switching Circuits discussed can be calculated by using the specified VCC and IC levels with Eq. 5-25. The transistor hFE(min) value can be used with IC to determine the minimum IB level required for transistor saturation. However, concern about the actual transistor current gain can be avoided by using an hFE value of 10. It is very unlikely that the transistor will have an hFE(min) less than 10, so a circuit designed in this way will work with virtually any low-current transistor. The resistance of RB for the direct-coupled circuit in Fig. 5-53 is calculated from Eq. 5-26. For the normally-on capacitor-coupled circuit in Fig. 5-57, Eq. 5-28 is used for determining the RB value. Typically, an RB value of 22 kΩ or lower is suitable for keeping the transistor biased off.